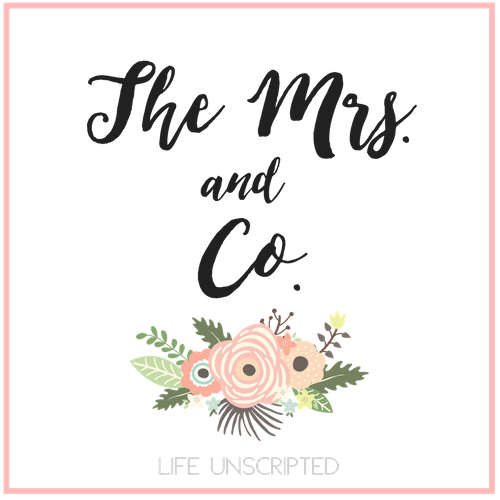 week 24 bump update and letters to Reagan - The Mrs. & Co.
Best moment this week: There have been a lot of best moments this week. 1. getting the nursery painted happened this weekend. Her theme is pink, navy, and grey. Her crib will go on the striped wall. 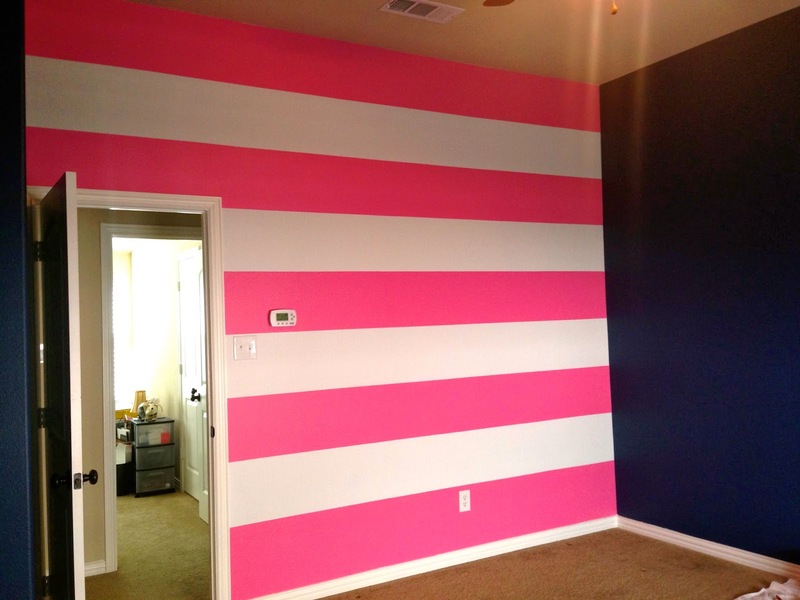 I'm pretty proud of our stripes! 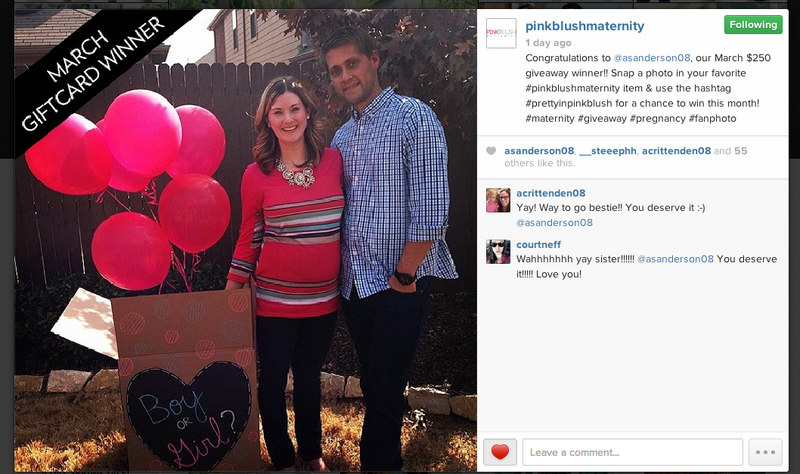 2. winning $250 to PinkBlush Maternity. Yep! This happened! All I had to do was hashtag #prettyinpinkblush in a picture on Instagram that I was wearing a PinkBlush item and I was entered into the monthly contest for $250. I've been trying since I got pregnant and I finally won! And the fact that this sweet picture at our gender reveal won makes it even more special. I will be doing a blog post once I receive all my items. Yes, I already used the gift card. I can't wait to get all of clothes! It's my favorite maternity clothing store for sure! 3. finally getting Rae kicking on video. Baby Rae finally cooperated and I got to capture her moving and grooving! Watch my right side (the top of the video) at about 7 seconds she lets out a big kick! Make my heart melt! Miss anything? I know this is vain, but I miss my pre-pregnancy arms. I know I'm supposed to gain weight, and I am not complaining about that, but the gaining of the weight has been harder to deal with that I thought. I am gaining it rather quickly and know I will be gaining so much more. Hence my not looking at the scale anymore. There's not much I can do besides eat healthy and get in as much cardio as I can. My body is going to gain the weight it needs for baby. Food cravings: Craving Chick-fila constantly! I could eat it for every meal! And love fruit :) I have a feeling this will be constant through the rest of the pregnancy! Symptoms: swollen everything (my rings are starting to get tight), constant peeing, leaking (lovely, I know! working on adding more kegel exercises to my day), round ligament pain, back pain, and I'm sure more will be added to the list as I get bigger! Belly button in or out? In! And I don't think it will ever pop. It's the deepest inney ever! It's starting to stretch sideways though. Wedding rings on or off: On, but I'm not sure how much longer. I plan on buying a fake ring alittle bigger in size so I don't have to be without a ring. I LOVE the nursery colors! It has to be so exciting to get to decorate for a little girl. Its an exact replica of the old one, just a different address. Your nursery looks great!! I love the colors, so different from everything I have been seeing :) Have a great trip!! Great update, Ash! Glad these are going well. Good job on the win!!! Love pink blush!! I see they are coming out with a non- maternity line! I'm excited!! Lol! You look fantastic!! Love the nursery so far! !